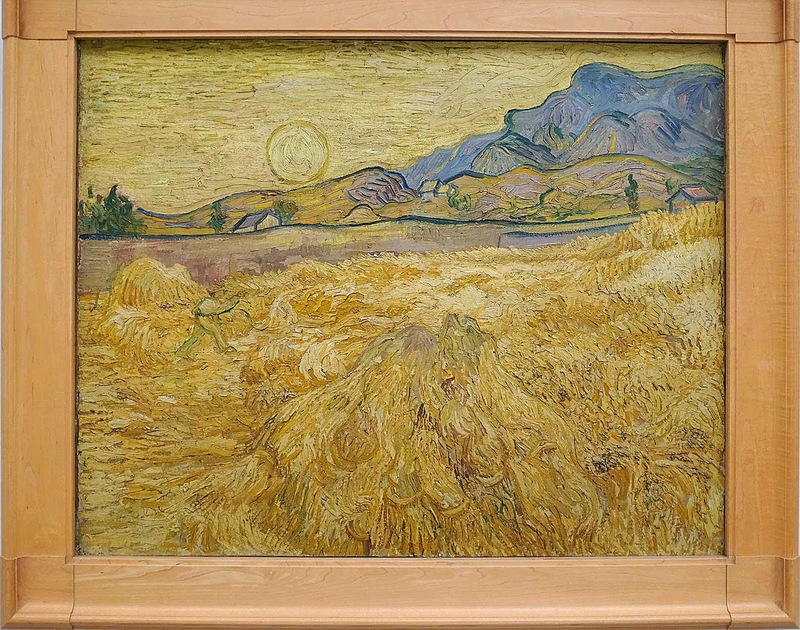 In previous entries I noted elements that made Van Gogh's work different from other painters. Another difference was the way Van Gogh drew. The short distance from his drawing to his painting strengthened his work. Once you see how his painting was inspired by his idiosyncratic drawing style his methods become more transparent. His drawings had a rhythmic calligraphic syncopation. The energetic dots and dashes of his drawings allowed Van Gogh to instinctively translate his vision onto canvas. Van Gogh had an inimitable style and I would never suggest expropriating his techniques. Yet the unique nature of his drawing style and the kinship between his drawing and painting are so obviously interconnected we might ask ourselves if our drawing has achieved its own unique nature. And if not, why? I suspect too many students are in such a hurry to paint they neglect fostering a unique drawing method. Unique drawing indicates a unique way of thinking about the visual world. Those qualities can then be applied to achieving a unique effect in paint. To the right is the painting Yellow Fields from The Kroller-Muller Museum from a photo by Erik te Kamp. Note the use of cloisonnism to contain the close values of the distant hills and mountains. 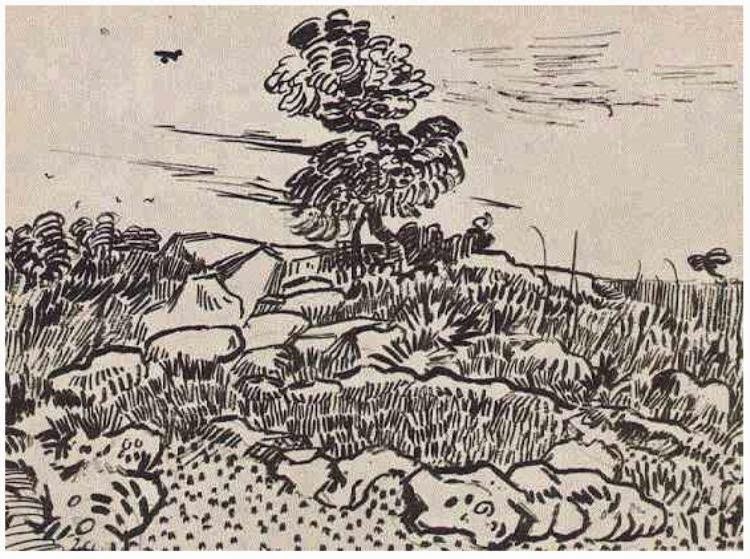 Rather than using value Van Gogh uses line to delineate the distant houses as well as the sun. 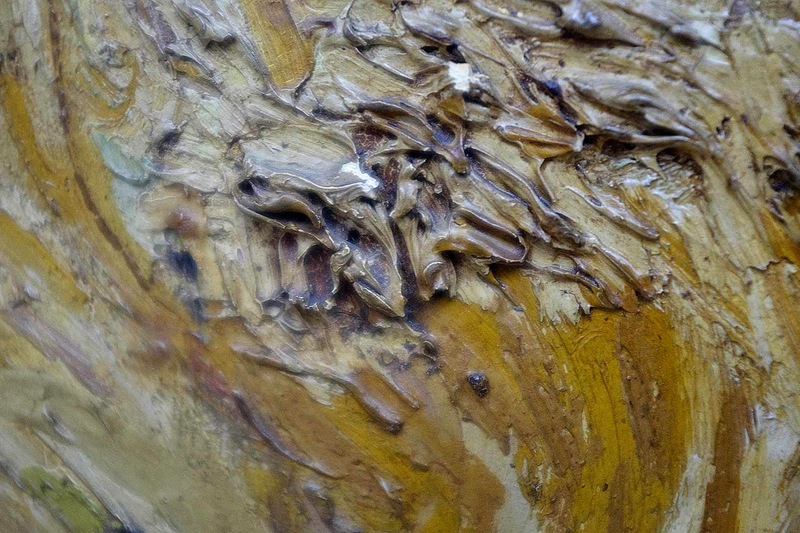 We see evidence of dry brush– where he let the paint dry and added touches of paint at a later stage. Once again we see little evidence that he loaded his brush–as all the strokes are of one color–the mixing taking place on the canvas at the edges of the strokes. This extreme close-up of a virtuoso clot of paint in the lower right quadrant seems to have evidence of glazing–another sign that Van Gogh thoughtfully modified his paintings back in the studio after the initial alla prima session. I'm impressed with the abandon embodied in this passage–any other color combination would not look as impressive–the muddy yellows and purples make the opposite color come alive. In this last close-up we see another example of dry brush and possible glazing in the lower section. The green line work most likely was painted after the initial paint had dried. The slightly purple pastels strokes offset the high saturation of the yellows and greens. Once again many thanks to Eric te Kamp for these excellent photos. This was a fun read, Brad. 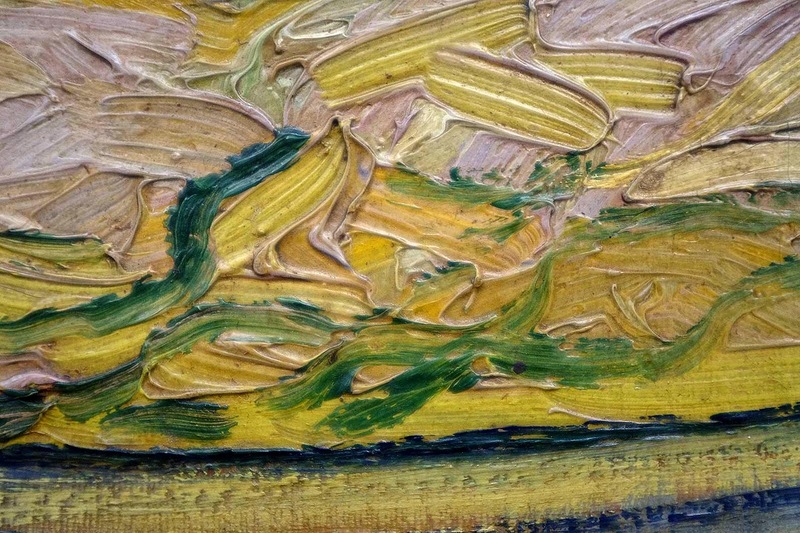 Van Gogh is one of the artists I admire specifically because of the way he sculpted the textures and strokes to form direction and fluidness around shapes. I just love it. You are very welcome, Robert! Thanks for the feedback.